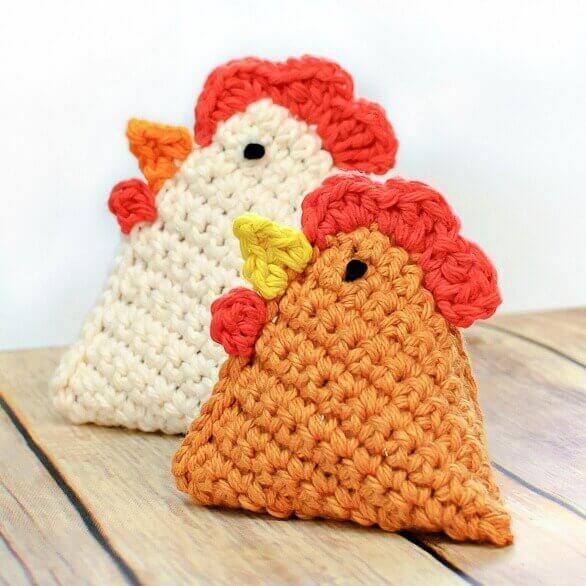 Work up this crochet chicken pattern to add some easy farm friends to your decor. I love how adorable my little crochet chick looks propped on my kitchen windowsill! I found these adorable fabric bean bag chicks on Gluesticks Blog and envisioned them as cute little Spring pets to decorate my kitchen. But since you already know I don’t drag my sewing machine out often, I decided to crochet them instead. 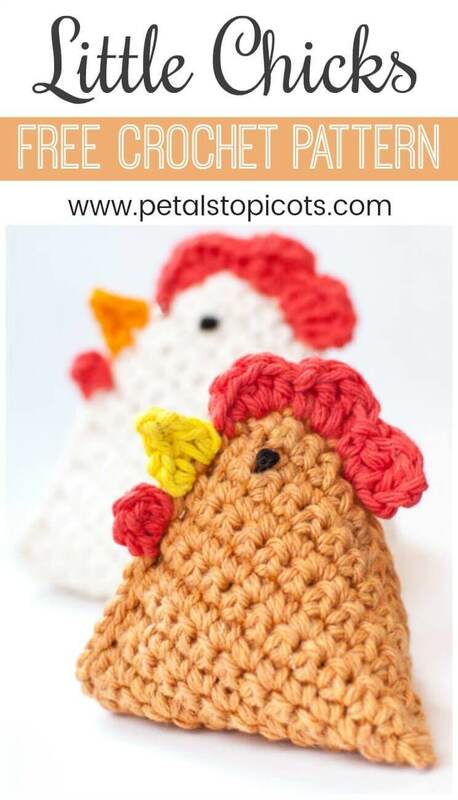 And there was hatched (ha ha) this cute crochet chicken pattern. A French translation of this pattern has been provided by Christelle Sobaba of Sobaba-Maternage Blog. Click here to download the French translation … Français pdf. Available as a convenient, ad-free pdf download here. Add this pattern to your Ravelry library. Finished sizes: Chick approx. 3½ in. ; Mama approx. 4½ in. With H hook and CA, ch 13 (17). Row 1: Work 1 sc in 2nd ch from hook and each ch across, turn — 12 (16) sts. Row 2: Ch 1 (does not count as st), work 1 sc in each st across, turn — 12 (16) sts. Rows 3 through 28 (38): Repeat Row 2. Fold piece so that Row 1 lines up with last row, slip stitch together to corner then slip stith down side to fold. Use G hook for Baby and H hook for Mama. Join CB in 4th st from slip stitched corner, ch 3 (counts as dc), work 2 dc in same st as join, 1 sc in next, 3 dc in next, 1 sc in next, 3 hdc in next, 1 sc in next, Sl st in next, fasten off. Join CC in next st, ch 1, work 1 sc in same st as join, ch 3, 1 sc in furthest ch from hook, 1 sc in next st, Sl st in same st, fasten off. 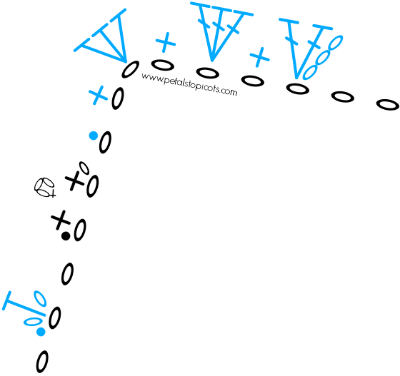 Skip next st, join CB in next, ch 1, 1 hdc in same st as join, ch 1, Sl st in same st, fasten off. With black, make a french knot for each eye as shown. Turn piece so opening is in back. Stuff a little fiberfill stuffing into the head. Fill about 3/4 of the way with dried beans (I used expired pop corn kernels I had on hand!). Close pouch and Sl st closed. That’s it! A cute little mama and baby chick now sit on my windowsill and keep me company as I do dishes. Check out more of my free crochet patterns here. How adorable these are! I had some scraps of the cotton yarn left from another project and made one mama and one baby…and then I made one mid-sized one by chaining 14 to start and doing 33 rows. I added a scallop for tail feathers to close. Love them all! What a great idea! Thanks so much for sharing! 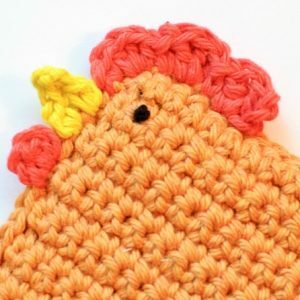 I’m confused about what happens after the 38 rows are crocheted…if I slip stitch the ends together, then I will have two openings and have no idea how the chicken ends up in a triangular shape. Will you please help! Thank you! This is adorable! I made some of these for a 2 year old cancer patient who loves chickens! He is bed bound and plays games with these as well as lines them up and says goodnight! I am always so grateful for people like you who share their talents and patterns for free. Blessings. That warms my heart to hear! Prayers for healing for your sweet little friend! Thanks so much for sharing about the pattern on Instagram. We buy farm raised eggs from a lady who works in an office setting. This will be a great thank you gift to her as a paperweight. (I crocheted her egg coasters last year). Bless you for sharing you work. Just made one for my kitty. I was trying to get a picture of it but instead I got a picture of him snatching it away. Very cute pattern thank you! Here are my chicken for my 2 boys. Thnak you so much for this pattern. These are adorable! Thank you! love your little chickens! Unfortunately mine failed! I tried making the smaller chicken … not sure how to assemble! I am going to have to find something a bit more weighty and make a few of these for my mom. She loves chickens, and these would be good weights for holding open cookbooks, with the right fill. I’ve linked your pattern in my post on Chinese Zodiac Chicken/Rooster patterns. Thank you für this pattern. so cute!!!! Would you consider doing a post on how to read the crochet symbols in your little drawing? You explain stuff so well! I admit I’m not too computer savey, but I refuse to print a pattern that has, like, 10 pages of comments. I love your pattern too, but I wouldn’t want someone using up valuable ink and paper to print my comment in order to get the pattern. Hi Ruth 🙂 I have a print button at the bottom of the page that only prints the post itself. It even allows you to delete photos or extra text you don’t want. Hope that helps. They are adorable – they perfect for little hands to play with. Je suis tombée par hasard sur vos jolies poulettes, et je les adore! Merci pour les explications, je ne manquerais pas de les tester et de faire un lien vers votre blog. Encore merci et au plaisir! These are so cute. 🙂 I’m pinning them! Oh my goodness these are adorable! I’m going to have to make a few! They are a lot of fun! I am so glad you like them, Brandy!! I LOVE your little chicks (as you can see). Thank you so much for the inspiration. So glad you came by to see! That is just too cute! Thanks for the pattern. These are cute enough, that I think they would actually make me enjoy doing dishes! Great job! I will stuff them with fiberfill and use them as cat toys. Your beanbags are gorgeous. 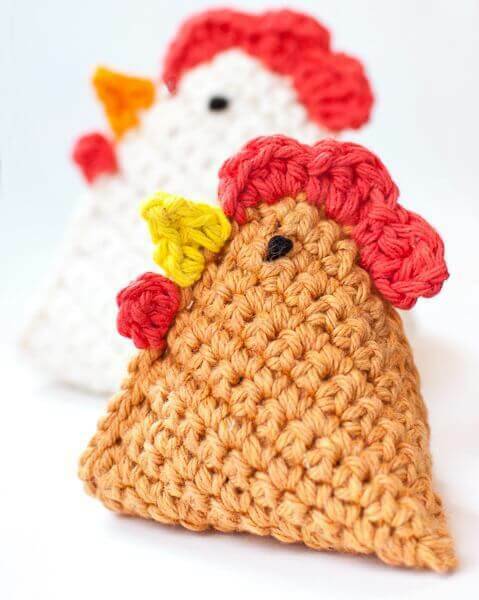 I made similar crochet easter chicks last year for Easter and wish I had thought of using them as paper weights. I love the comb detail. Thanks so much, Dedri! Paper weights are a great idea!! That does sound nice … A whole rainbow family! These are ADORABLE! I would be happy to feature your pattern on my blog, Create Happy Crafts. I hope you will stop by and submit your project. Sorry, I had my dates confused. I meant to say your pattern will be featured on Sunday, April 13. Thanks so much for featuring me! What a cute crochet project! How talented! Love these for paperweights!